Top 10 Reasons To Hire A Professional Wedding DJ. A professional wedding DJ will walk you through the process and make sure you aren’t missing any important details like song selections, when songs get played and for how long, what songs NOT to play, who is giving speeches, announcements etc etc. An experienced wedding DJ will act as a background coordinator, working with the venue manager making sure your timeline stays on time. There is an average of 20-25 songs an hour that get played during the dance portion of your reception and in order to keep everyone happy and excited, they all have to be a hit. 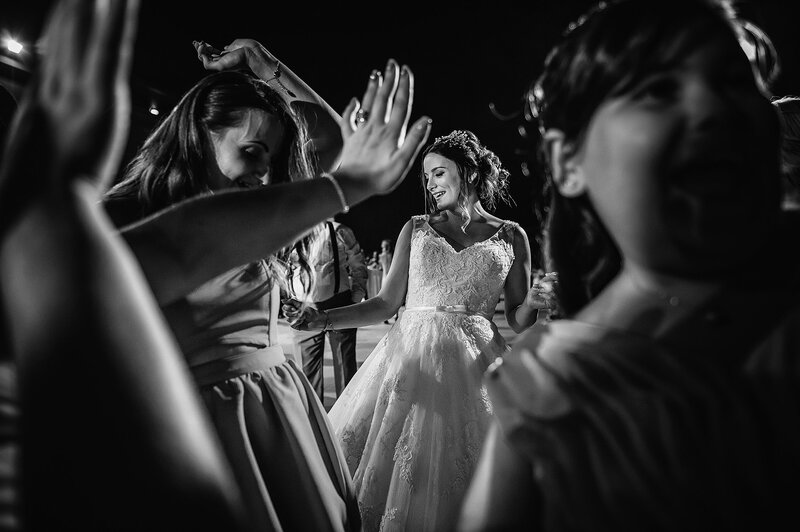 Most weddings have a wide range of ages and it can be difficult to please everyone at the same time since each generation has their favorite dance tunes. A professional wedding DJ can take your requests and weave them into crowd pleasing favorites that bridge your group together, so that everyone stays on the dance floor all night. We only use top industry DJs at Malta DJ Events, many who have made a name for themselves playing at bars, nightclubs, and festivals, and have the ability to beat match songs together to create a seamless transition from one song to the next for maximum dancing fun. A professional wedding DJ will arrive early to your venue and setup the right gear in the best location for optimal sound. We only use top of the line sound equipment, brands like Pioneer, RCF , Shure to make sure it creates the perfect audio atmosphere for your guests. True pros also have backup equipment available in case something were to go wrong on the day such as a guest spilling a drink on the equipment, etc. Malta DJ Events even has back up DJs in case of an accident or something unfortunate on the day of your wedding. Pro DJs can read a room and play the right song, at the right time. They can keep the night moving along, making necessary announcements to let people know what is happening and when and also organise guests for speeches, wedding entrances, and traditional formalities. When shopping around for DJs, you’ll probably notice a wide range of pricing for services and equipment. The old saying “you get what you pay for” couldn’t be more true when it comes to hiring the entertainment for such a special occasion. Yes, it’s easy to find a cheap DJ to play at your wedding, but most likely you would be sacrificing experience, equipment, and peace of mind of having someone who won’t disappear a week before the wedding day. The widely respected, wedding industry website, The Knot recommends allocating 8-10% of your wedding budget for entertainment Malta Dj Events offers entertainment packages that tend to be less than these percentages, saving you money so you can put it towards more important things, like margaritas on your honeymoon. There are 2 types of wedding DJs in this world. Cheesy” traditional wedding DJ that talks heavily on the microphone and continually creates crowd interaction by announcing songs, playing games, talking to guests, cracking jokes, and generally over-using the mic to help move the night along. The contemporary-styled DJ more reserved on the microphone, making announcements only when necessary, playing a seamless mix of classic and current hits, and tends to blend into the background of the wedding and not be a focal point. Here at Malta DJ Events we pride ourselves on being the latter type of DJ. Our DJs have years of experience not only playing private events, but also playing in public venues where it is frowned upon to be a “Cheesy” DJ. They are used to mixing songs professionally on turntables and CDJs, creating a soundtrack for listeners to focus just on the music, and not the person playing it. We let the music do the talking. You’ve spent countless hours picking the perfect colours, the perfect flowers, the perfect lighting, and the perfect pair of shoes for your big day, why shouldn’t you also pick a DJ that cares just as much as you do about the “look” of your event? A professional wedding DJ will be groomed and wear the appropriate clothing to match your wedding like a suit and tie for formal weddings, business casual for the relaxed wedding, or even shorts and some flip-flops for your destination beach wedding. The appearance of the DJ’s equipment should also be of importance, making sure the equipment is clean, there are little or no wires in site, and their DJ area is clutter free. We care just as much as you do about how our DJ area looks in your photos! Unless you are having your ceremony, cocktail hour, dinner, and dancing, all in the same room, you are going to need someone with the experience and the right equipment to handle multiple areas at your wedding. Music, microphones, and lights need to be available on cue as guests get shuffled from one area to the next and having everything setup by a professional is really the only way to handle this.